garden furniture set can help make the most out of smaller outdoor spaces with its corner design. Its acid etched coffee table has a surface that is just over a metre square in size, making it functional and stylish. 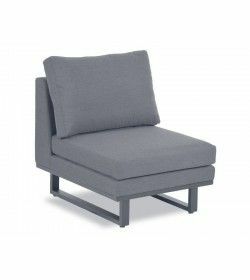 This corner piece includes wide armrests that provide ample space for comfort and support, or to hold drinks and accessories. Its acrylic fabric is water and stain-resistant and can be easily wiped down when cleaning. with a classic design, reminiscent of interior sofas. 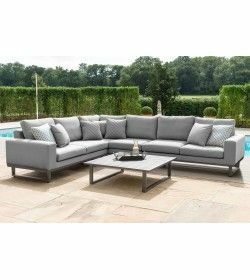 Ethos truly unifies your inside and outside space by blurring the lines between house and garden, whilst still retaining the features of premium outdoor furniture. This all-weather fabric can be left outdoors all year. La Vita fabric is specially designed to be resistant to UV light, water, salt, mould, chlorine, stains, and other outdoor hazards. It can be cleaned with lukewarm water and mild soap or with a pressure washer, and the fabric dries quickly.